These Homemade Strawberry Fruit Roll Ups are a fun, natural way to enjoy a better version of the childhood snack! Only three ingredients are needed to make it. Can you think of a food that you would eat off the ground? Back in college when my husband ate pizza that had been on the ground I gave him a pretty hard time about it. About a year later we were walking to the library, and I had just bought a strawberry fruit rollup from the candy store. I ripped the package open a little bit too eagerly, and the fruit rollup flew out of the package and started rolling down the sidewalk. I ran after it, plucked it off the ground, ripped off the outer layer, and ate it. I know. Such a hypocrite. He won’t let me live this one down. In case you couldn’t tell, I’m a pretty big fan of fruit rollups. 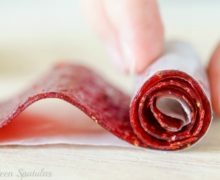 Today’s homemade version is a cross between a fruit rollup and a fruit leather, and it only requires three ingredients! Let me show you how to do it. Pour that mixture into a saucepan and stir in some sugar and lemon juice. 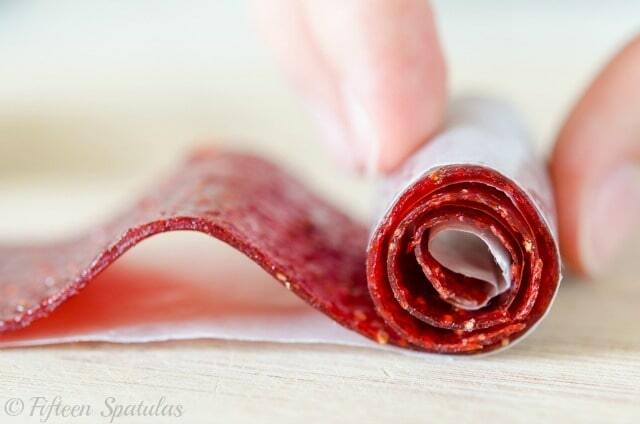 Then you can roll each strip up into a fruit rollup! 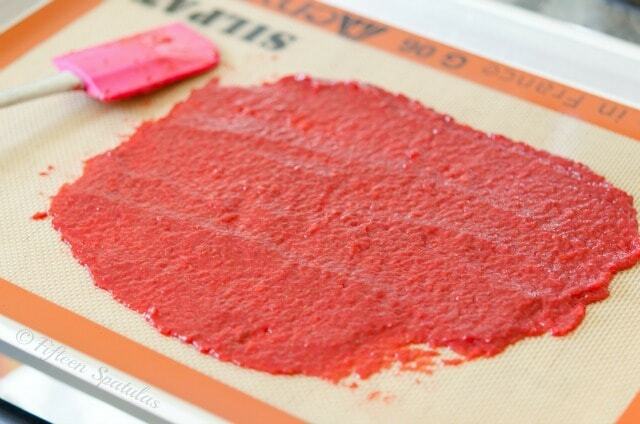 You can use frozen strawberries for this recipe, just make sure to thaw them before pureeing. Just as with any other recipe where you are dehydrating something in the oven, it’s a bit of a guessing game judging when it’s done. 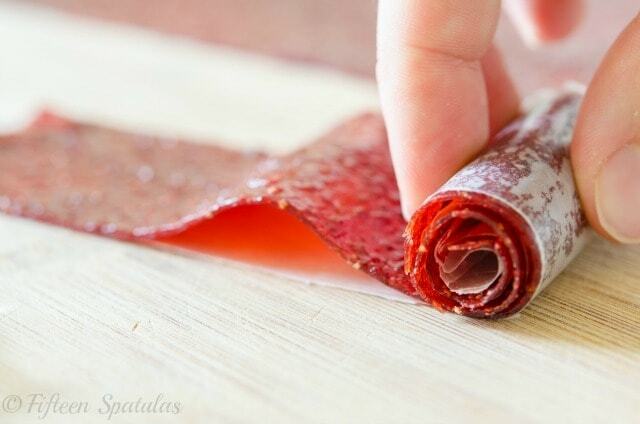 You’ll know the rollup is done when it doesn’t feel sticky, just a bit tacky. Don’t bake for too long or the rollup will turn into a crispy chip! If your oven doesn’t go to 170, you may need to open and close the door to moderate the temperature. 200 degrees seems to be the highest you should go for this recipe. 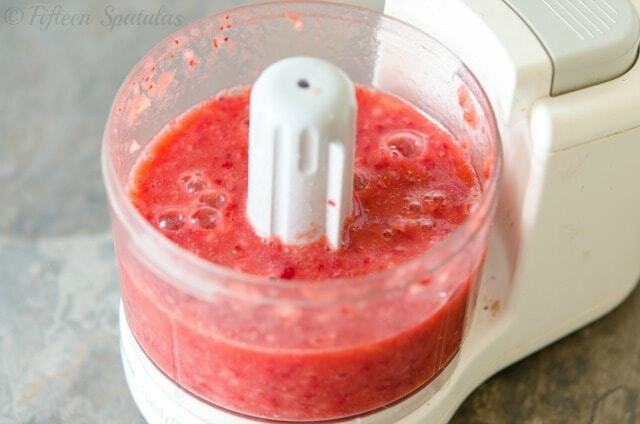 Place the trimmed strawberries in a blender or food processor and puree them for a minute or so until smooth. You don’t want any strawberry chunks in the mixture. 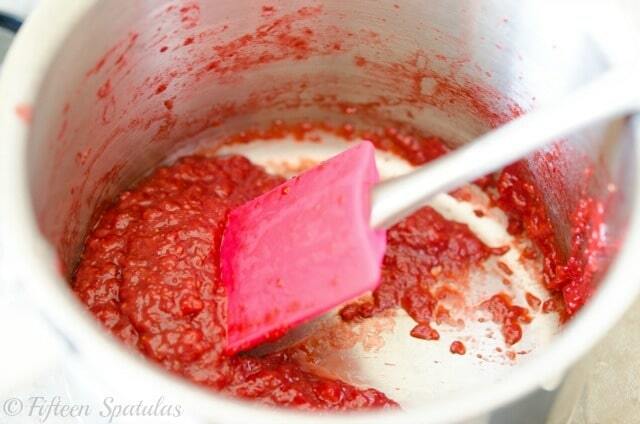 Transfer the strawberry puree to a saucepan and add the lemon juice and sugar, if using. 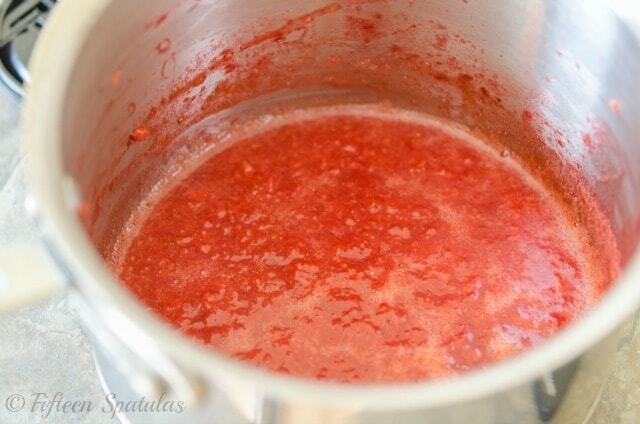 Turn the heat to medium high, and cook the mixture for about 10 minutes, stirring frequently, until the mixture is thick and jammy. The goal here is to cook out much of the moisture. 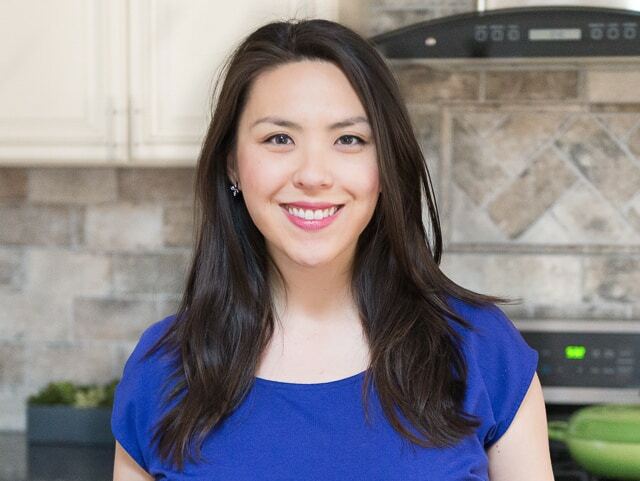 Preheat the oven to 170 degrees F, or as low as your oven will go, making sure it’s less than 200 degrees at the highest. 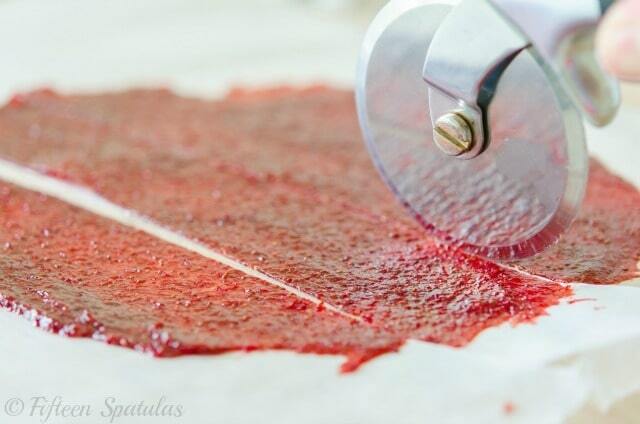 Spread the strawberry jam into a rectangle shape onto a baking pan lined with a silpat or parchment paper. You may use an offset spatula or a regular spatula to help spread the mixture as evenly as possible, until the rectangle is about 1/8 inch thick. 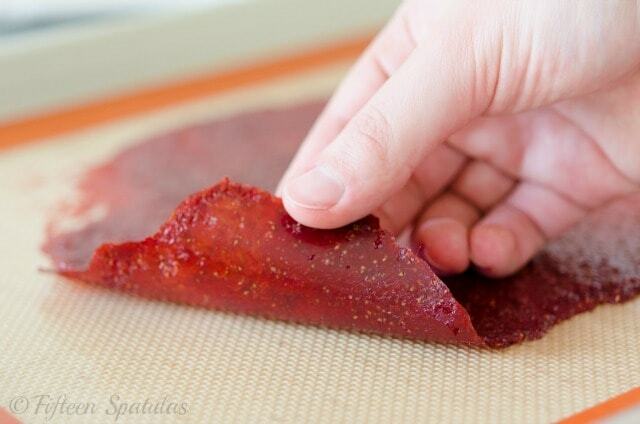 Keep in mind the fruit leather will lose some of its thickness in the oven as it dehydrates, so make sure that none of the jam is so thin that you can see through it as you spread. Cook in the oven for 3-4 hours, until the fruit mixture no longer feels sticky, just a bit tacky. Remove from the oven and let it cool completely. Transfer to a cutting board lined with wax paper, and use a pizza cutter to cut long strips. Roll them up into the fruit rollups, and enjoy! Are you absolutely certain you did not use wax paper? Parchment paper doesn’t stick to anything. A lot of people think wax and parchment are the same, so this is usually my first guess.